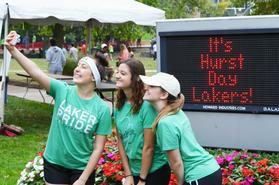 Guided by the Core Values of Mercyhurst University, the Evelyn Lincoln Institute for Ethics and Society (ELIES) works to raise awareness of ethical issues that confront people in their social and professional lives. ELIES provides information about current challenges facing our local and global communities, opportunities for development of ethical sensitivity and innovative strategies for dealing with ethical problems and conflicts. 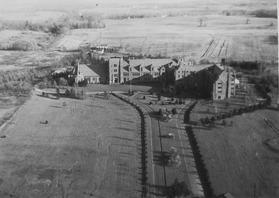 These issues are addressed through lectures, symposia, and round tables. ELIES provides formal and informal programs throughout the academic year as well as spontaneous programs in response to current events. 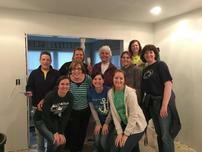 Do you have an event you'd like to sponsor or co-sponsor with ELIES? Fill out the online form! ELIES invites regional and national scholars and professionals to give public lectures on social, political, professional, technological, and environmental ethics throughout the academic year. 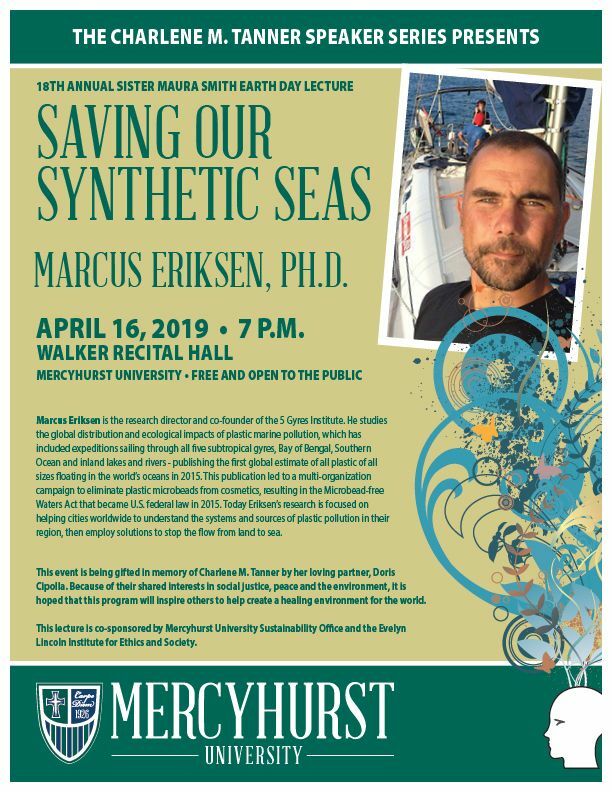 For example, partnering with the Sustainability Program, the Institute offers the Sr. Maura Smith Earth Day lecture. The ELIES also provides the community with a keynote lecture every Spring semester. On February 2019, ELIES hosted a panel presentation entitled "Is This a Crisis? Understanding and Responding to the Drug-Resistant Bacteria Problem." Panel members included Dr. Amy Danowitz (Department of Chemistry), Dr. Lucy Thairu (Department of Public Health), and Dr. Randy Clemons (Department of Political Science). In 2018 ELIES entered its 11th year and were excited to welcome Dr. Swasti Bhattacharyya, Professor of Philosophy and Religion on April 26, 2018. Her lecture was titled "Converging Rivers: Healthcare and the Intersections of Religion, Culture and Ethics." 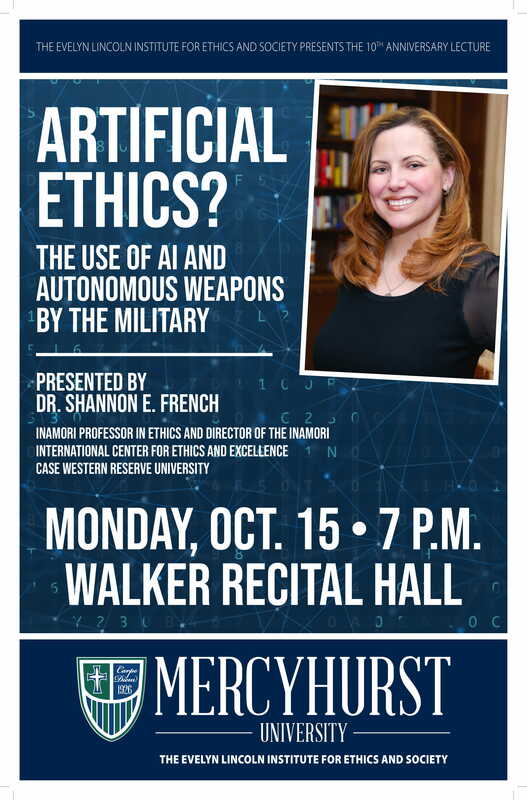 On October 15, 2018, ELIES welcomed Dr. Shannon French, Inamori Professor in Ethics and Director of the Inamori International Center of Ethics and Excellence at Case Western Reserve University. Her lecture was titled "Artificial Ethics? The Use of AI and Autonomous Weapons by the Military." 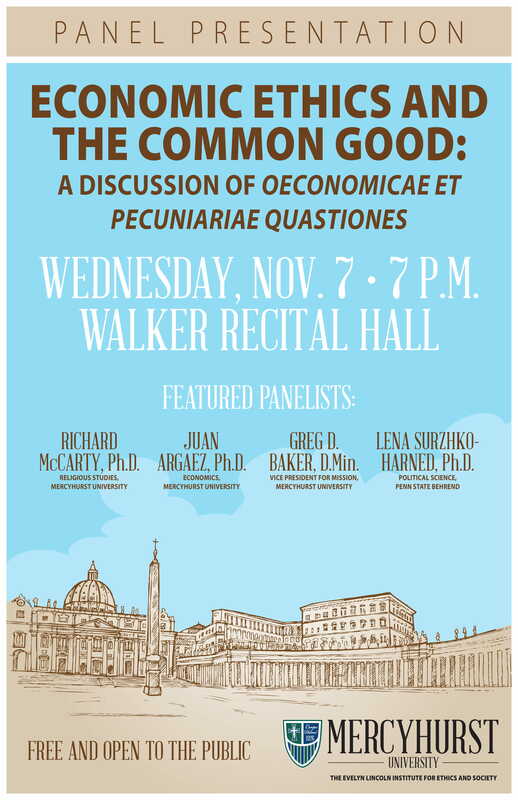 On November 7, 2018, ELIES hosted a panel presentation entitled "“Economic Ethics and the Common Good: A discussion of Oeconomicae et pecuniariae quastiones”. This panel included Richard McCarty, Ph.D., Religious Studies, Juan Argaez, Ph.D., Economics, Greg Baker, D. Min., Vice President for Mission Integration, and Lena Surzhko-Harned, Ph.D., Political Science, Penn State Behrend. ELIES runs a series of student centered symposia. 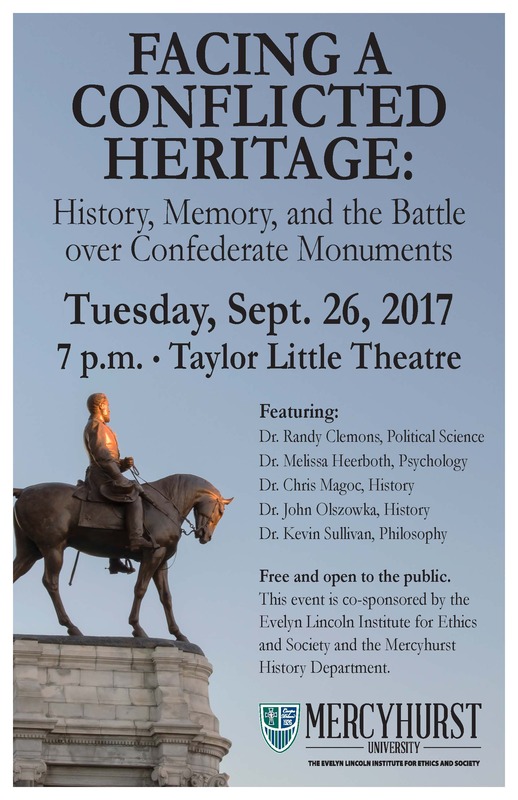 Once a month students in the University capstone ethics course are invited for an informal faculty led discussion of topics that affect our communal lives and are in the faculty’s areas of expertise. In 2017-18 these symposia will be led by Dr. Maria Garase (Criminal Justice), Dr. Emmaleigh Kirshner (Criminal Justice), Dr. Ed Jolie (Anthropology/Archeology), Dr. Amy Danowitz (Chemistry), and Dr. Scott Michel (Sports Medicine) among others. ELIES will also be able to provide continuing education credit for professionals and professional societies upon request. Please contact the director for more information. Students seeking the ethics minor will be required to take six courses (18 credits). All students are required to take the foundational Introduction to Ethics course, PHIL 190. They will also be required to choose from a selection of second level ethics courses offered by Philosophy, Religious Studies, Catholic Studies, or Anthropology. Finally, students take three elective courses from the approved list, which come from a variety of departments. All students must take a minimum of one 300 or 400 level course. There is an additional requirement of an internship through ELIES that will be either zero or 1 credit, depending on the needs of the student. Those internships will require the approval of the ELIES director. At least one course must be 300 level or higher. Each spring ELIES works with the Rotary Club of Erie to provide an all-day ethics symposium for high school juniors from the Erie area. Each year roughly 250 high school students attend large and small group presentations and lectures and discussions. This event will be expanding to include invitations to these students to attend ethics courses on campus and invitations to relevant public lectures on campus. ELIES is also looking to develop a regional presence through the creation of working groups that bring together scholars in a variety of disciplines to create innovative and holistic responses to issues such as environmental ethics and social justice. They also established the annual Rotary Ethics Symposium for high school juniors. Panel Presentation: "Is This a Crisis? 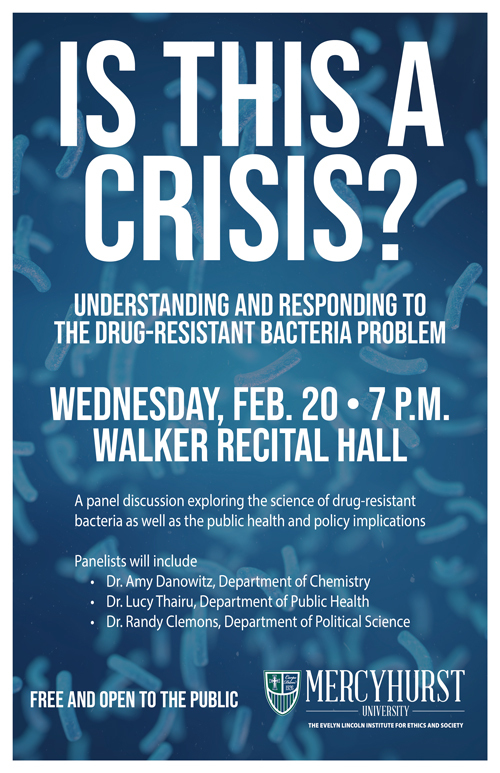 Understanding and Responding to the Drug-Resistant Bacteria Problem"
These small, student-only gatherings offer opportunities for students to discuss a topic in detail with a faculty member with expertise in the area. These are not lectures; students are invited to bring their points of view and their questions. Each gathering will meet for about one hour, and refreshments will be served. “How do you know if you have consent?" 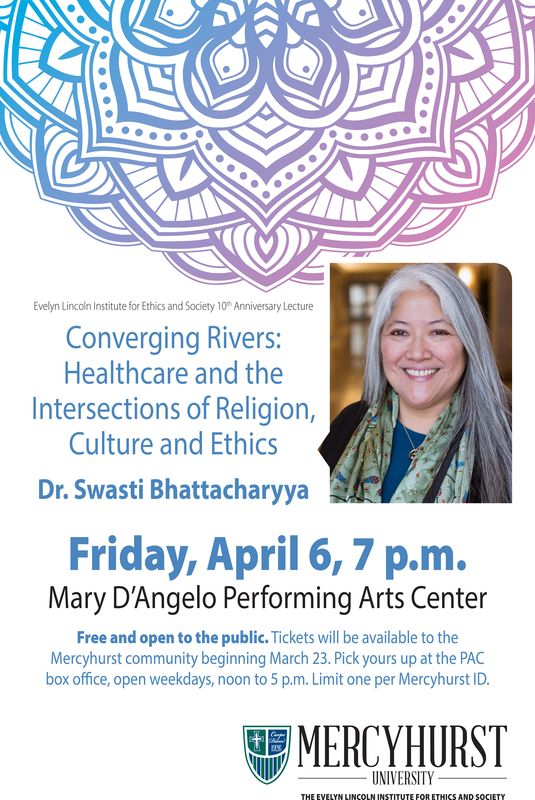 10th Anniversary special lecture, “Converging Rivers: Healthcare and the Intersection of Religion, Culture and Ethics,” given by Dr. Swasti Bhattacharyya. Dr. Bhattacharyya is a bioethicist who also has a degree in nursing. 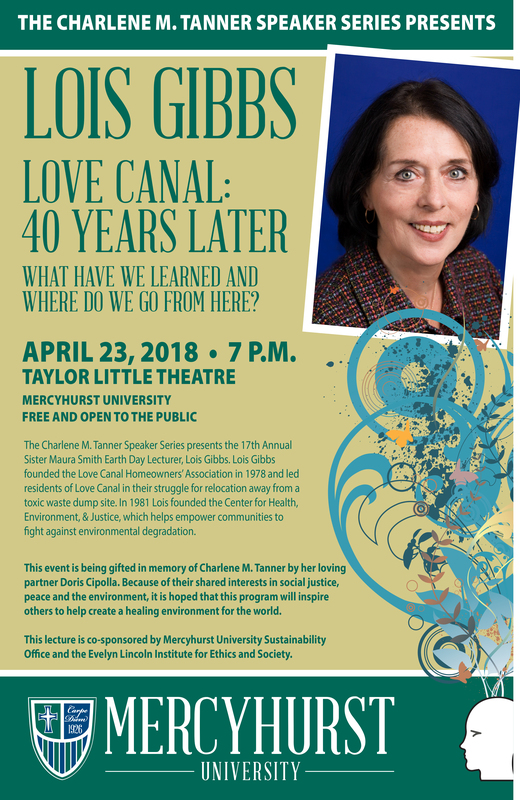 Annual Sister Maura Smith Earth Day lecture will be given by Lois Gibbs, the founder and executive director of the Center for Health, Environment and Justice. Co-sponsored with the Sustainability program. ELIES will present “Enemies of the People? 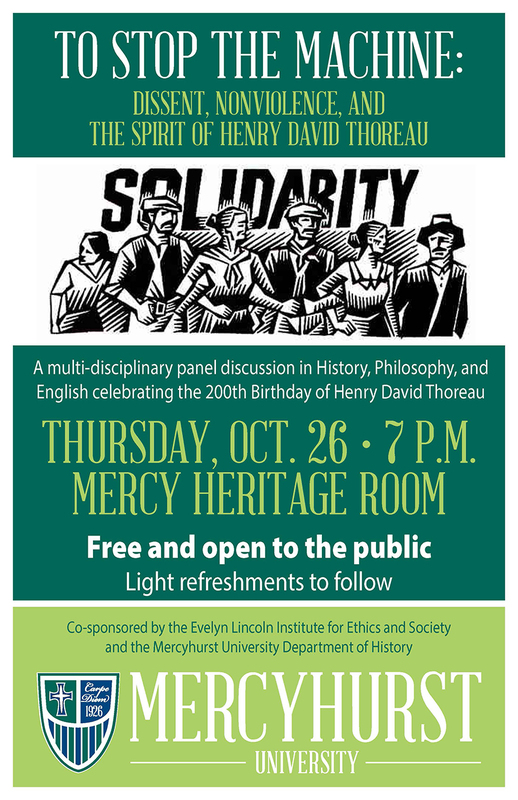 A Forum on Journalism and Ethics.” This round table will include both Mercyhurst faculty and members of the local media. They will be addressing issues of journalistic ethics and the role of the First Amendment of the Constitution in shaping the role of journalism in a democratic state. A student symposium led by Dr. Amy Danowitz, Chemistry. This open to all Mercyhurst seniors. Please contact Dr. Ehret or the ELIES office to confirm attendance.